7 Standard Lengths - 18 to 58 inches x 1.5" wide. With 3 to 10 pegs. 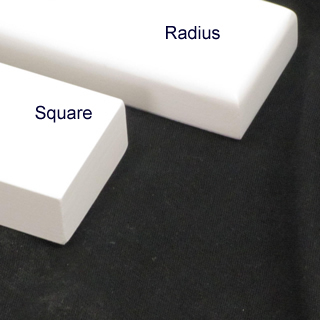 Optional radius or square edge detail. Mounting holes positioned every 16 inches on center. Matching White button plug covers included. Love the peg rack. Exactly fits what we needed it for in a utility closet. I needed to put the rack in a difficult position under a shelf but the holes did not line up with studs. Would have loved it if you had offered the use of mollys instead so only could give it a 4 star rating. We eventually used some mollys that we had but it would not quite fit flush with the wall surface but it still works! We have used these racks in our previous home and highly recommend them because they are so versatile. Love our peg racks. I ordered 3 and all were perfect. Shipped fast too! 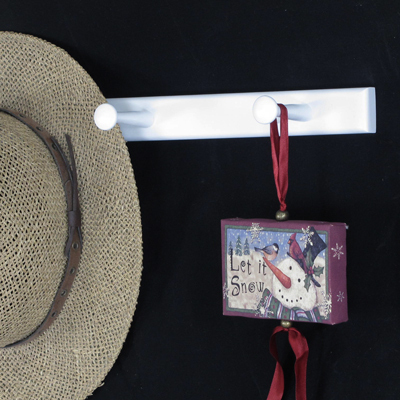 I am a handbag designer and purchased many of these rails in different sizes to line the walls of my studio. They are perfect. Super easy to install and now I can easily locate my patterns and handbags. I like the narrow profile! love the 18 inch peg rail for our master bath! perfect for robes, etc. Super easy to install and the final product looks great in out entryway. Thank you! Our pegs came very quickly and are great. They are definitely helping keep hats and coats off the floor. Q: Hi, I'm interested in a custom length of the narrow peg rack square edges in white. Do you have pegs that are any shorter than 3"? Like 2", or 2-1/2"? Thanks. Q: how long are the pegs? I am looking for at least 4 inches long, 5 would be even better. These are going to be scarf racks and I don't want to scrunch up the scarves to get them to fit. Thanks!! Our pegs extend 3" from the rail. I checked with my supplier they do not have a 4 or 5" peg. If you would like I can do some searching to see what I can come up with? 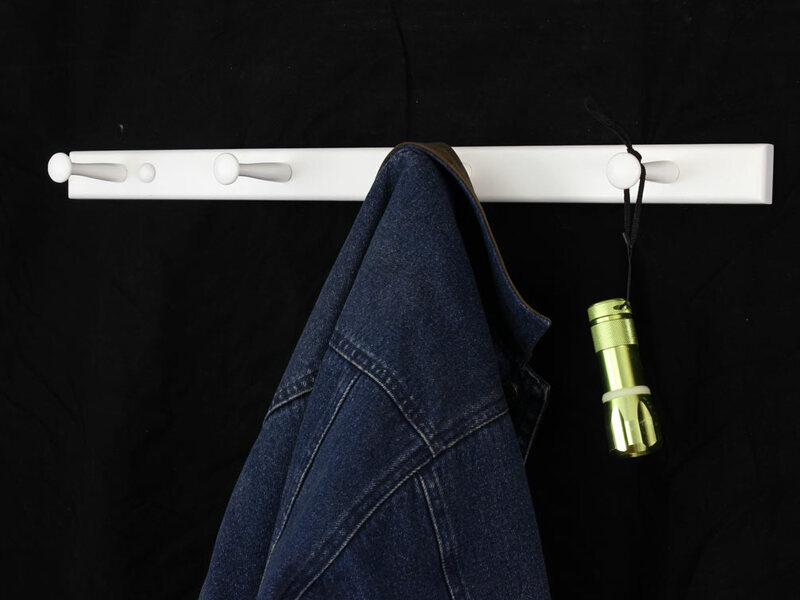 Q: Wood Type or White: black Length of Coat Rack: two units - first 38" long, second 80.75" long narrow 1.5", square edge - painted black - high gloss if possible Type of Hooks or Pegs: pegs Number of Hooks or Pegs: /- 9 pegs on 38" rack, /- 20 pegs on 80.75" rack Please advise on standard peg spacing for your rails. I have estimated about 4" on center but would like to have whatever is your standard for both units? We have discontinued Black as a color option. Our standard peg spacing is 6" on center, we can space them to meet your needs. We would be happy to make these unfinished for you, or in any of our other colors. Q: Please send me a quote. I may make the order for a different length but am curious to know the cost for such a long piece? It can come in a few segments and certainly does not need to be one long strip. 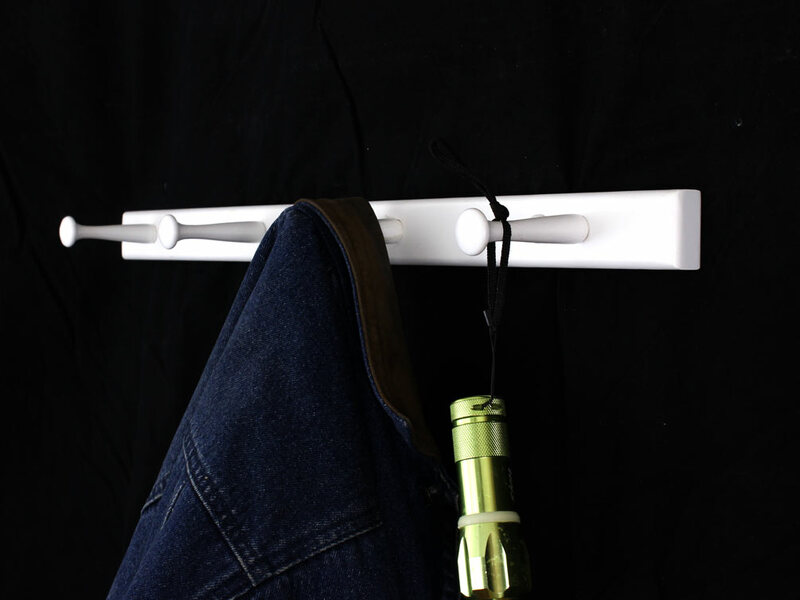 looking for a white narrow Peg rack, 78 inches long with a square edge profile. We can make a 78" x 1.5" peg rack for you. We can make these really long the problem is we can only ship up to about 96 inches economically. Please provide your shipping address and I'll be happy to put together a quote for you. Baby, it’s cold outside! You shiver as you look at the snow falling gently onto your front porch. You are on your way to run errands and you certainly don’t have time to search for your coat and keys. It’s a good thing you have one of the narrow white peg racks conveniently hung by your front door. There they wait – your wool pea coat and tartan plaid scarf. You don’t have to search. They are ready for you to bundle up and face Jack Frost. This piece features a solid hardwood construction Do you need more than three pegs? Don’t worry. This rack is available in multiple lengths. 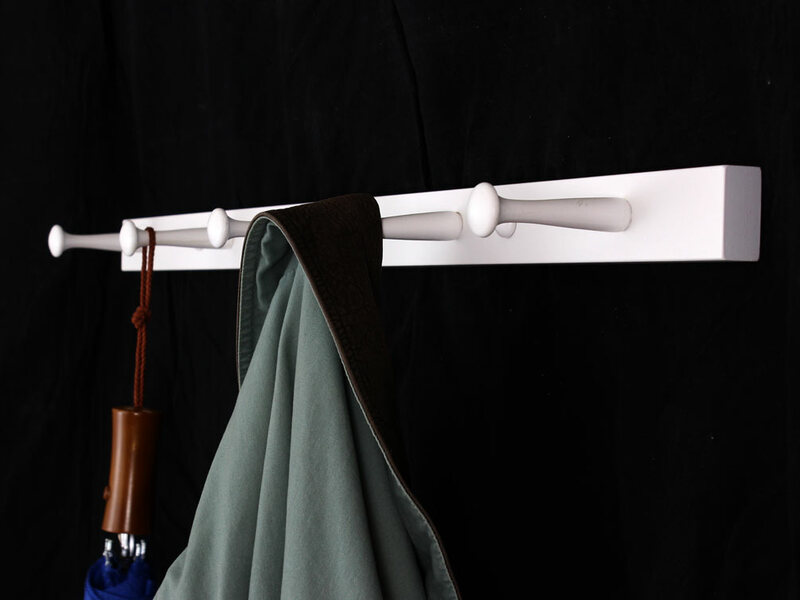 You can even get a custom size, which is good if you live in North Dakota and have lots of coats to hang.